Save an extra 20 per cent off a subscription to the world's leading digital art magazine. 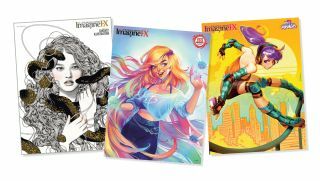 For 24 hours only, you can save an extra 20 per cent on an already festive subscription price to ImagineFX magazine, for both the print and digital editions. It’s a great offer and you can also use this discount on everything else in our online magazine store, too! Save an extra 20% on IFX using code FESTIVE20 now! Subscribe to IFX now and enter code FESTIVE20 at checkout to claim your discount. But you’ll need to be quick: the offer ends at 16:30 GMT Thursday 7 December. Here's the cover of our 150th issue, featuring artwork by Loish. We’ve had quite a year here at ImagineFX. Not only did we celebrate our 150th issue with an amazing cover from Loish, but we also featured the cover art from a variety of talented artists, including Tran Nguyen, Richard Anderson, Andrew Mar and Jana Schirmer. We’ve featured interviews with legends like Syd Mead and Greg Manchess, and had workshops from the world’s leading artists who are at the top of their field in book illustration, comic art, animation, game art and more. Here's Richard Anderson's bright concept art cover! We’ve put together a little clip of all the covers from this year so you can see the breadth of talent and art skills. We’d love you to join us for 2018, and what better way to do that than with an extra money-off deal? Don’t miss out! Subscribe to IFX now using code FESTIVE20 at checkout to secure this amazing offer, or give a year’s worth of industry insight and inspiration as the perfect gift for artistic friends and family.